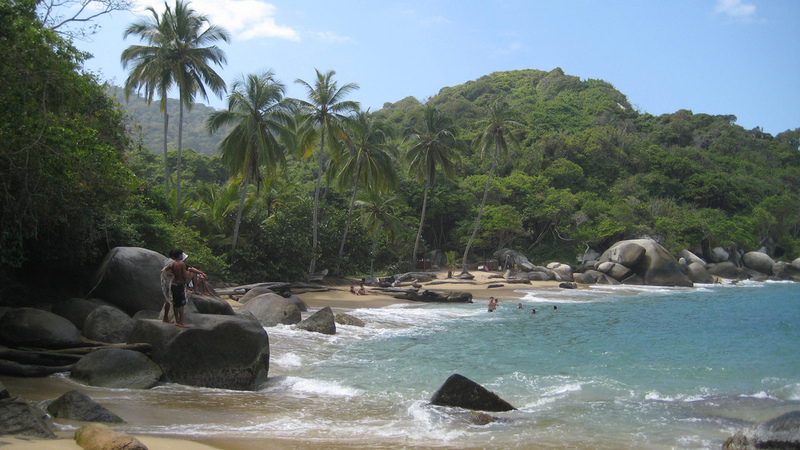 Tayrona is located on the Caribbean coast, 35km from Santa Marta, and is one of Colombia’s most famous National Parks. Not only is Tayrona National Park home to some of Colombia’s most gorgeous beaches, it is also rich in Colombian culture, wildlife and tropical rainforest. This 12,000 hectares of land and 3,000 hectares of ocean maintains a temperature of between 25c and 30c year round (the rainy months are from May to June and September to November). The Park was created in 1964, and turned into a National Park in 1969 to protect and promote ecology and archaeology; it is of great natural and cultural importance. The pre-hispanic Tayrona tribe called this area home and built small villages and communities here. Descendants of this tribe, called Koguis, plus three other groups still live here and maintain their cultures and traditions. Tayrona National Park can be reached by bus (COP6,000 or US$2), by car from Santa Marta, or alternatively by boat from Taganga (COP25,000 or US$8.50). The park entry is around COP42,000 (US$14) for foreign tourists and COP16,000 (US$5.50) for Colombian Nationals. Once in the park there are two options for the journey to the beach: hiking or taking a van from the entrance (COP3,000 or US$1). This National Park is spread over a large stretch of the coast and within the park there are plenty of beaches to explore. After a 45 – 90 minute picturesque jungle hike from the entrance, you will arrive at a small village called Arrecifes; this village has restaurants, shops, accommodation and lockers that are free to use (padlocks aren’t included so you need to bring one or buy one from a store in the park). Arrecifes has a beautiful beach area, but swimming is prohibited due to the strong current and huge waves. A 15 – 20min walk from Arrecifes takes you to La Piscina, another small village with a variety of accommodation and restaurants. Here swimming is permitted in natural swimming pools and La Piscina is also home to one of Tayrona’s large number of coral reefs, perfect for snorkelling, with rays and lobsters and much more besides. A 15-20 min walk from La Piscina takes you to the next village: El Cabo. This famous picturesque beach is one of the most recognisable in the park and swimming is permitted here too; it’s a great place to snorkel and marvel at the Caribbean reefs and tropical fish. El Cabo also has a number of restaurants and types of accommodation on offer such as hammocks, cabanas and a camping area. Tayrona has a number of fun things to do such as snorkelling, to discover the unforgettable coral reefs; swimming; hiking or just relaxing. There are two main hiking trails leaving from El Cabo – one to El Pueblito and another called the 9 stones hike (9 piedras). El Puebilto is a one to two hour hike (2.4km). This town is an archaeological site and gives you an insight into how indigenous communities lived in previous times; this town is pre-hispanic and similar to the Lost City or Ciudad Perdida. The Nine Stones hike, (Nueve Piedras) a hike around the park following egg-like stones at points along the way, is a good way to see more of the park and its environment. Tayrona is home to over 108 species of mammals (including 3 species of monkey – Red Howler, Capuchin Mon and the Cotton-top Tamarin), 300+ species of birds, 70 species of bat, 31 species of reptile, 110 different types of coral, 401 sea or river fish and over 770 plant species. To avoid the crowds, try where possible to visit the park in low season (February to November) and arrive early to get a good spot or find accommodation. While you can purchase food and drink in the park, it is significantly higher in price than outside so it’s advised to bring food and drink for your stay (but note that no alcohol is allowed to be brought into the park). You can find cheap food in some places within the park such as El Cabo, where you can purchase typical Caribbean influenced meals such as fresh fish, patacones, and ceviche, as well as fresh juices from food stalls. Suncream, water and bug spray are essentials for your visit to the park. While Tayrona National Park is a beautiful and picturesque place to visit, remember it’s a sacred place for many indigenous tribes; treat it with respect and take all rubbish and belongings home with you.